Welcome one and all to the Cephalopod Coffeehouse, a cozy gathering of book lovers, meeting to discuss their thoughts regarding the tomes they enjoyed most over the previous month. Pull up a chair, order your cappuccino and join in the fun. Please go to this link if you wish to join in the fun. The Armchair Squid. During the month of August I read 10 books, a couple were novellas and disappointing, out of these 10 books, two were not very good (the novellas), three were an OK read, four were quite good reads and one was outstanding which I will review here. 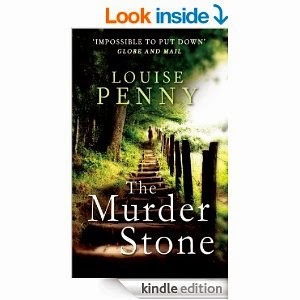 The Murder Stone (A Chief Inspector Garmache Mystery Book 4). It is also published under the title A Rule Against Murder. As the heat rises and the humidity closes in, some surprising guests turn up at the Finney reunion…and a terrible summer storm leaves behind a dead body. Now it’s up to Chief Inspector Gamache to unearth long-buried secrets and hatreds hidden behind polite smiles. The chase takes him to Three Pines—into the dark corners of his own life, and finally to a harrowing climax. This is the fourth book in the Inspector Gamache series set in and around the village of Three Pines. This story takes place in a remote hotel on the other side of the mountain from Three Pines called the Manoir Bellchasse where Armand Gamache and his wife are celebrating their wedding anniversary with a few days away. The Finney family arrive to stay for a family reunion at this hotel. One of the family members is unfortunately murdered and Inspector Gamache has to admit he is a police officer and brings in his team to help solve the murder. Louise Penny’s descriptions of the hotel, the background of the building, the owner, the staff and the paying guests are eloquently described so that you feel as though you are there. The height of summer, the heat, the thunder storm that happens, the feelings of the main characters and the secondary characters all have equal thought put in to them. As usual with a murder mystery there are twists and turns, red herrings to lead you down various paths all written in a believable manner. The means of the murder is unusual, the how is not revealed until the last few pages when all the threads are pulled together neatly. We learn more of the family background of Inspector Gamache and his small team, with prejudices showing up from bigoted people. We're on a big mystery kick at our house. This series sounds like fun. 10 books in a month - very impressive! (Sigh) I already miss reading for fun. I'd love to read a great mystery right now. Unless it's written for 8-year-olds, I can't, though--it messes with my writing too much. This one sounds awesome! Sounds terrific... like one of the old classic mysteries I used to read. Thanks for the recommendation! Nice to meet you. Count me in as your newest groupie. This actually does sound like an interesting mystery. I don't read many mysteries (although I used to read a lot of Agatha Christie as a kid), but I'm thinking about trying that genre again. Thanks for the recommendation! I have been looking for something different to read. This sounds great! My choice for this month's Coffeehouse was a mystery too, and your's sounds intriguing! I shall check this one out! What I want to know is why they changed the title. I don't understand it either but Louise Penny is a Canadian author and it might be something to do with US/Canada/UK markets although why publishers think we can't understand the original title is beyond me. Can't believe you read ten books in one month! I can barely finish half of that number in the same amount of time. I love mystery thrillers too. This book might be good for my list. Thank you for this recommendation Sally. Like Anne, I can't believe you read 10 books in Aug. I read 1 and a half.... oh well... you are the pro. Hi Sally. Wow, you read a lot of books too. It's disappointing when books let you down. I'm back into Richard North Patterson again now and enjoying him. This sounds really good, Sally, and you did a great job on the review. Sometimes these mystery books are so much fun. I've had a hard time with my book choices this summer. Some have just drug on and on, or were good but hard to get into at first. I just finished Anne Rice's "The Feast of All Saints", set in the late 1800's in New Orleans. So good, with a lot of detail. Right now I am reading "The Diary" by Chuck Palunuk. That man has a twisted and creative mind, lol. Thanks so much for coming by to see me so often! I'll be over here playing catch up.